"After just a few days of using the RAV Power Knightrider 14000mAh, I was hooked and now take it everywhere with me!" In my work, I sometimes work long days shootings weddings, properties, stock and so on. For much of it, I need power. Power to run Go Pro cameras but also my phone and tablet. Why are my phone and tablet so important? When shooting a wedding, I tend to do a lot of video work too, especially with the Go Pro cameras. I love to place them in hard to reach places to get the best footage I can. This happens all day. I also use external screens for shooting on a gimbal or with my DJI Inspire drone. Firstly I need power to help run those cameras. The batteries only tend to last between 1 and 2 hours. Secondly, I operate them from my iPod Touch, iPad Mini 4 and Samsung Galaxy S7. All of which need power. When shooting properties, I have also been known to hook my Smartphone up to the battery pack and fire up the music player. I do this knowing I won’t run out of juice during the shoot. Whistle while you work and all that! This is where the RAV Power 14,000mAh battery charger comes in. It is a well sized unit with a nice matte black finish that is fingerprint proof and able to withstand light scratching. For your Apple products, you just need to use the cable that came with your Apple iPhone, iPad, iPod etc. The version I got is a 14,000mAh power bank. That is a huge amount of juice for such a small unit. It is slightly wider but slightly shorter that my Samsung Galaxy S7 which makes it about the same surface dimensions overall. It’s just a bit thicker...3 times as thick actually. Just for comparison, the older Samsung Galaxy S4 battery is 2,400mAh and the Go Pro batteries are 1050mAh. That means the RAV Power 14,000mAh battery charger will charge the Go Pro camera around 12-13 times and the Samsung Galaxy S4 around 5 times. That is more than enough power to get me through a wedding or any other shoot. A weekend music festival or even a week’s holiday where there is no power available. Brilliant. I love the confidence that having this much power to hand gives me. There are times when you need to know you can power your Smartphone in emergencies for example. The whole unit is very simple to use. The cable that you use to charge you Smartphone or Go Pro i s the same cable that you use to charge the RAVPower 14000…simple! You can charge the unit from either the mains output on your wall or via your PC or laptop. The main button on the unit must be pressed before charging will start. It will turn itself off when not in use to preserve power and holding the main button down for 2 seconds starts the flashlight. The flashlight is pretty bright with a fairly tight beam so very handy indeed. I can’t imagine how long the flashlight will work for on 14000mAh! Recently, I took this unit with me for a weekend in Kent and London and it performed flawlessly. I was able to leave the unit attached to my phone in my jacket pocket as it charged my Samsung Galaxy S7. It never got hot. Overall I am completely sold by this power unit. Especially as it charged my Samsung Galaxy S7 from completely dead to full in 1 hour 20 minutes. 14000mAh is plenty power for most Smartphones, tablets and cameras. I know it will always be with me on long trips, holidays and photo shoots. I don’t just use it for charging, I use it as a source of power even when the phone, tablet or camera is fully charged. This way, I know that when I stop using that unit, there is still full power available for when I am unable to attach it to the RAVPower battery pack. 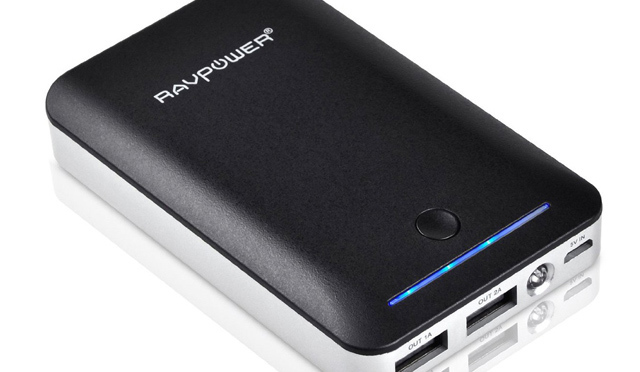 For $40 or £30, RavPower battery packs are a steal and give you peace of mind! One thing to be aware of is that the RAV Power Knightrider 14000mAh itself takes a fair while to charge due to its enormous capacity. I leave it charging overnight. I then feel safe in the knowledge that the next morning, I will have enough power to last days and days. Also, when charging my aging but still cool Samsung Galaxy Note 10.1 (2014 edition), it emits a high pitched noise. Not always noticeable depending on the environment but the noise is there just the same. When charging anything else...silence. Where to buy your power pack?